Have you asked this too? Or did someone ask you this question as well? It's quite normal for us to ask for advice from people most dear to us, even if they're not the right ones to ask for sometimes. But elementary reasoning would tell that it should not be the case. You have concerns over your health? Go see a doctor, not your neighbor who sells powdered guava leaves. If you think it's not a good idea to ask a question to the wrong people, then what more if you will ask the wrong question to the wrong people? Most people were not satisfied with either the answer or the result (when they followed the answer) because their question is wrong incomplete in the first place! Yes, an investment should have a definite goal or an objective in order to determine what investment option will best answer the need. An investment objective may either be short-term (new gadget, out-of-town travel), medium-term (new car, out-of-country travel) or long-term (house, Asian cruise, educational plan, retirement). Thus, if you want to invest your 5,000 Pesos so you can buy a VIP ticket for the One Direction Eraserheads reunion concert in 2024 (I'm a fan, bear with me), you need to find an investment where your P5,000 will earn at least 12% per year in order to buy that P15,000 ticket (Gulp). With this in mind, you can then proceed in finding which option is best for you. This is where I'll give you the answers as to where you can invest your P5,000! Before you continue, it is crucial that you understand how Mutual Funds work. If you have no idea what a Mutual Fund is, click here. If you already know Mutual Funds, you should consider your risk appetite next. To determine your risk tolerance level (which will determine which type of fund is best for you), take the Free Risk Profiling from BPI. SLAMC is the fund manager and principal distributor of the biggest family of mutual funds in the country – the Sun Life Prosperity Funds. The company is the first in the industry to have an accounting system that adequately complied with the standards set by the International Accounting Standards (IAS). Simplicity, Accessibility, Affordability and Returns. These are only a few of the benefits that a Sun Life Prosperity Fund investor receives. 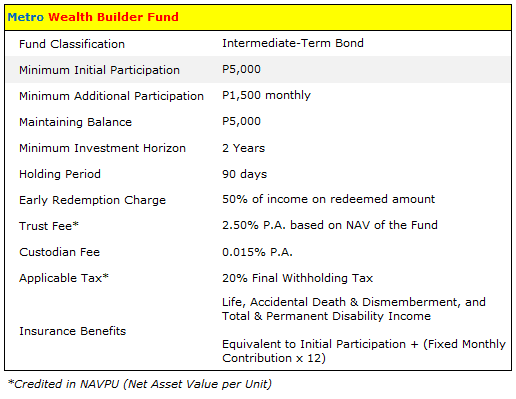 To know which Fund Type from Sun Life is best for you, you can view their simplified assessment form here. To know more about Sun Life, visit their website. PhilEquity is an investment management company committed to helping investors achieve long-term financial goals and aims to be the preferred investment management company of their target customers seeking the best-managed funds and excellent customer service. PhilEquity provides a very good investor education on their website that contains various articles and tools designed to help you become better informed as an investor. To know more about this, click here. To know more about PhilEquity, visit their website here. The ALFM Mutual Funds (Ayala Life Fixed income Mutual fund) are open-end investment companies registered with, and regulated by, the Securities and Exchange Commission (SEC). As of December 2013, the aggregate Net Asset Value of the funds amounted to about P98 Billion. To date, the ALFM Mutual Funds have the largest market share in the mutual funds industry in the Philippines. ALFM Mutual Funds consist of six (6) funds, each having an own investment objective to suit and meet the needs of investors. With the help of BPI Express Online, you can access your ALFM investment account anytime, anywhere. To know more about ALFM Mutual Funds, click here. First Metro Asset Management , Inc. (FAMI) was established by First Metro Investment Corporation (FMIC) in partnership with the Catholic Educational Association of the Philippines (CEAP) and Marist Brothers Foundation to engage in the mutual fund business, promote savings mobilization and advocate investment literacy among Filipinos. To know more about Save & Learn Mutual Funds, click here. Philam Asset Management, Inc. (PAMI) is an asset management company that administers, distributes and provides investment advisory to several mutual funds. PAMI is a wholly owned company of Philam Life – which is a member company of the AIA Group. Established in 1992, PAMI is one of the largest asset and wealth managers in the mutual fund industry with more than Php. 40 Billion Assets under management (AUM) as of June 30, 2014. A major contributor to the development of the Philippine mutual fund industry, PAMI is a leader in asset management in the Philippines, managing nine funds from different asset classes for different client risk appetites. If you want to test your Financial IQ, try their online test here! 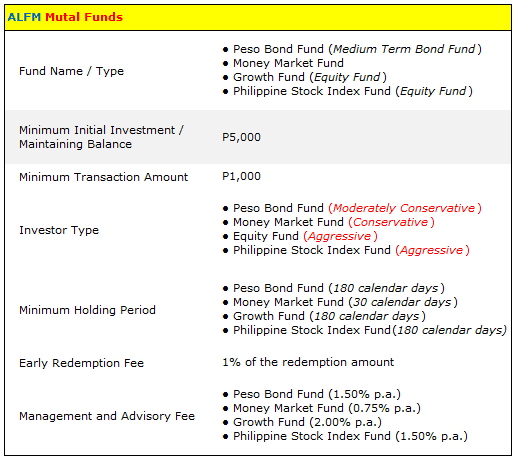 To know more about PAMI's mutual funds products, click here. Do you want to start investing in Mutual Funds but you're still lost and don't know exactly where and how to start? Let me help you, send your inquiries or contact me here. UITFs are offered by several banks but since our goal is to find investments worth P5,000 and below, I'll just be listing those that offer them as of posting. To know the difference and similarities between Mutual Funds and UITF, click here. To know the top 5 best performing funds, click here. For UITF Yield Calculator, click here. The BDO Easy Investment Plan (EIP), an investment scheme that enables you to attain your financial goals and financial wellness through the twin habits of regularly saving and investing. The EIP is for individuals who wish to have a medium to long-term saving and investment plan so that they can achieve their financial goals and financial wellness at some future time. 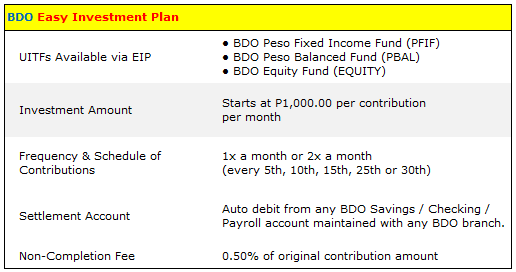 To know more about BDO's Easy Investment Plan, click here. The PNB Global Filipino Funds are money market funds specifically designed to meet the investment needs of our Overseas Filipino Workers (OFW's) and their beneficiaries. It provides them with an outlet to accumulate their savings for the purchase of a new home or educational plans for their children or other future needs of their families. To know more about PNB's Global Filipino Funds, click here. The Fund is a peso-denominated money market fund suited for clients who have an investment horizon of at least one month, a moderate risk profile, are focused on preserving their principal at all times, and looking for a non-volatile investment fund. It aims to achieve for its participants income and liquidity by investing in a portfolio of short-term peso-denominated deposits, BSP-SDA, repurchase agreements secured by government securities, and money market instruments with a maximum weighted average duration of one year. To know more about the Metro Wealth Builder Fund, click here. The Gintong Sikap Secure Fund is a Unit Investment Trust Fund (UITF) that provides the investor with higher earnings from a diversified portfolio of high-grade government securities, money market securities and other highly marketable fixed income instruments and equities. The GSSF intends to achieve for its participants growth on their investment through pooled fund investments to provide a better yield than invested individually. The Fund was launched on August 8, 2006. 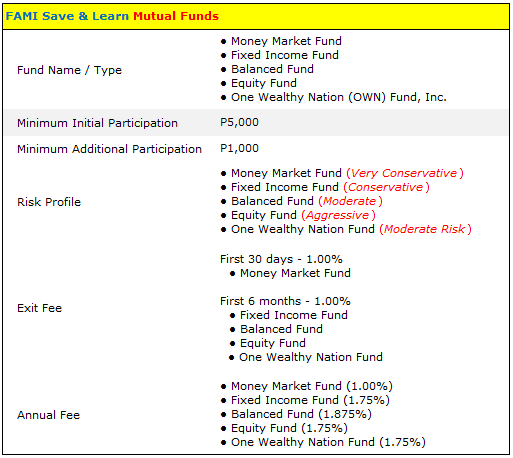 To know more about how to invest for as low as P500 (that's not a typo) on DBP's Gintong Sikap Secure Fund, click here. If you're confident enough to invest directly where Mutual Funds' and UITF's fund managers place their pooled funds, then you can buy shares of some of the companies via the stock market. If you have no idea how the stock market works, click here. Please keep in mind that the companies listed below were just randomly picked by me. I do NOT recommend nor promote buying any shares from these companies and I shall NOT be held liable for any loss of buying stocks if the price per share you bought changes and resulted to a loss in paper value. 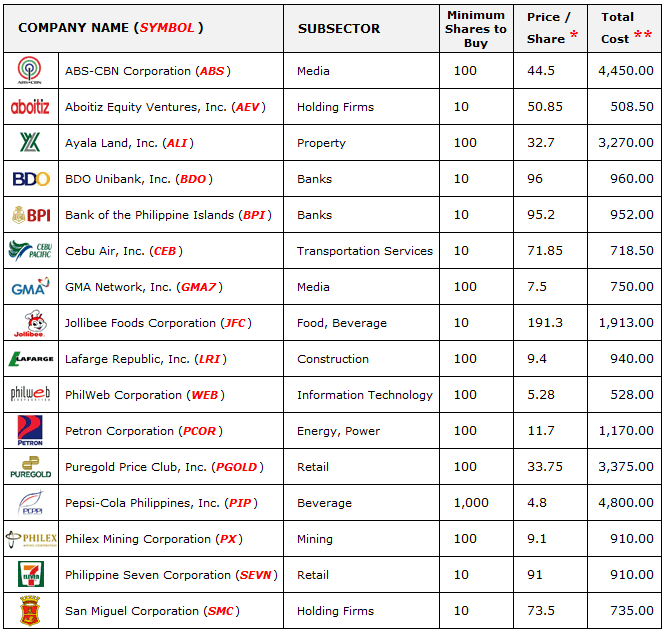 As of posting, here are some of the company shares you can buy with your 5,000 Pesos. 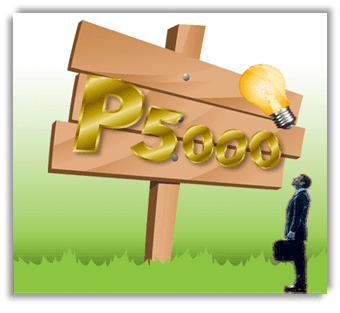 If you did not find any of the investment options above great for your 5,000 Pesos, you can always start a small business instead. 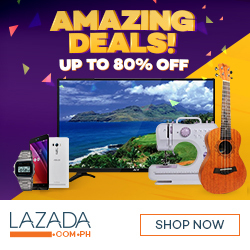 You can do buy and sell of goods such as bags and apparels (maximize social media to promote your business) or you can even setup your own on-line store! You may also want to consider selling foods where you're good at such as pastries and made-to-order cakes or delicacies. What I'm trying to say is that there's practically an unlimited opportunity out there on the streets and your very own neighborhood waiting for you! While this may require more analysis and time (since you're holding not just your own P5,000), this kind of venture is more likely to succeed if given proper planning. It would be completely better if your co-investors would be willing to share their expertise, experience and ideas with you to come-up with a great business idea. But if you already have a business plan in mind and only requires capital to start, then all you need to do is raise that needed amount for your business! I've saved the best for last. If you find the above options to be great for you, then you must be excited to know the best investment, huh? Well, there is -- yourself. Remember that the best investment that you can make is to invest in yourself. Be informed and stay informed. Start educating yourself by reading books and attending financial literacy seminars. I suggest you don't go for e-books since there's a great chance you'll end up not reading the book because (1.) you got if for free and (2.) there's a lot of distractions stored in your gadget. Attend seminars - both free and paid. Knowledge is the key to discovering the great opportunities around you! If you buy a book for the sake of being able to say to your friends that “I have this book” or displaying it to a shelf, then that money simply becomes an expense. See to it that you buy a book and you read it so it becomes an investment to yourself. In a generation saturated with #hashtags and selfies, books remain the undefeated source of learning, wisdom and inspiration. Opening a book means opening a door to so many possibilities! Do you know that the best investment is probably the cheapest too? If you find any of the investment options good for your 5,000 Pesos, then I suggest you start as soon as possible. Remember that interest rate is your ally in building your wealth. And interest rate works hand in hand with, of course, time. So the earlier you start investing, the better. Saving is fundamental. But saving alone will not suffice. Not when inflation is just around the corner. Don't just save. Save, then invest. Will you invest your money or will you keep it in your drawer? Where do you plan to invest your P5,000? Receive FREE updates on great articles like this when you subscribe to PisoandBeyond! wow. very detailed post! thanks!!! If you plan to invest monthly in Mutual Funds, you need at least P1,000 as most companies require that minimum amount for subsequent payments. What you can do is save the amount until it reaches P1,000 before you invest it. The same is true if you plan to invest in stocks directly, atleast 1K din ang kakailanganin mo to buy the minimum shares for each company. It will depend on your target, timeline and risk tolerance. If you really understand how the stock market works, then you can go with it as it really has the superior returns over mutual funds. Mutual funds, on the other hand, gives you the power of diversification already for as little as 5,000 pesos which you can barely do if you're investing directly in stocks. hi po. ask lng po ako, compounded interest po ba lahat ng namention nyo above? or based on initial deposit lng po ang basis ng interest? thanks..
8% to 12% (Per Annum) is actually a conservative rate of return to consider. 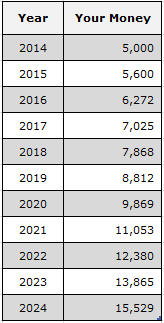 However, always keep in mind that such figure depends on the performance of the fund, hence no guaranteed 12% per year (unlike regular savings account that earns a steady 0.75% per annum). Ask po ulit.. Do i need to have an existing account with the bank im planning to open a UITF or can i open a UITF as my primary and only account? I'm not sure (if there's any bank that allows opening an investment account without any savings or primary account with them). Thank you po.. :-) compounded nman po dba ang UITFs? Hi.... Good day poh... Panu poh ba process ng pag.invest sa stock market? I have little knowledge regarding stock market and the process.. Can you furtheassist me? I would really appreciate it..
or you can send me a message using the "Contact Me" form of this site and I'd be glad to respond to your inquiries. jeff.. pls help to further understand the concept of investing/buying shares.. im a beginner and i need a better person to lecture me, do you have any colleagues that u may suggest.. im looking forward for your response..here's my email roqorowe@gmail.com. indeed, im really interested. For OFWs, it is more affordable to invest in ETF (exchange traded fund) because of the low fee. ETF is like mutual fund and stocks. You can trade ETF just like stocks. And it also has dividends monthly, quarterly, or annually, depending on the the type of funds.